CBD may help to reduce stress, anxiety, pain, and inflammation. It is a promising therapeutic agent in the battle against epilepsy, cancer, Alzheimer’s and Parkinson’s disease. What exactly is CBD and what does the science say? Multiple hours on the keyboard and pulling weeds in the garden have given me arthritis trouble in my fingers. When I was discussing this with a friend, she recommended CBD oil to help ease the pain and inflammation. That got my attention. Is there any research to back this up? 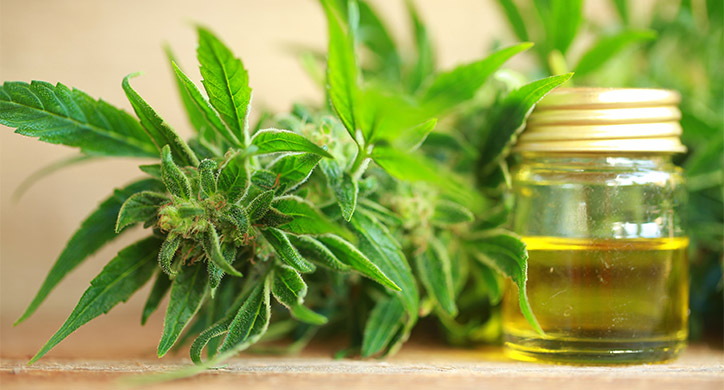 CBD has jumped into the consumer spotlight because of the shifting regulatory landscape of marijuana and hemp, and the recent FDA approval of a cannabis-derived CBD medicine for rare types of types of epilepsy. Producers of CBD are taking advantage of the growing library of science supporting a wide range of health benefits, and most particularly, consumer demand. You can drop CBD on your tongue as a tincture, rub it on your skin as a cream, inhale it as a vapor, eat it as a gummy bear, or drink it infused in water. The FDA has not approved CBD as a food supplement. There are two reasons. The Drug Enforcement Agency has moved CBD drugs (prescription, as the epilepsy drugs), with a THC content of below 0.01% to a schedule 5 drug, provided the drug has been approved by the FDA. Any other CBD product is still wrapped up in the federal marijuana ban. While it is easy to buy CBD online, (THC must be below 0.3%), there is a lack of testing standards. A recent study indicated that 70% of online CBD extracts are mislabeled. CBD, or cannabidiol, is one of many naturally occurring compounds called cannabinoids in marijuana and hemp plants. CBD and THC (which is what gets you high), are the most studied for their effects on the brain and immune system. 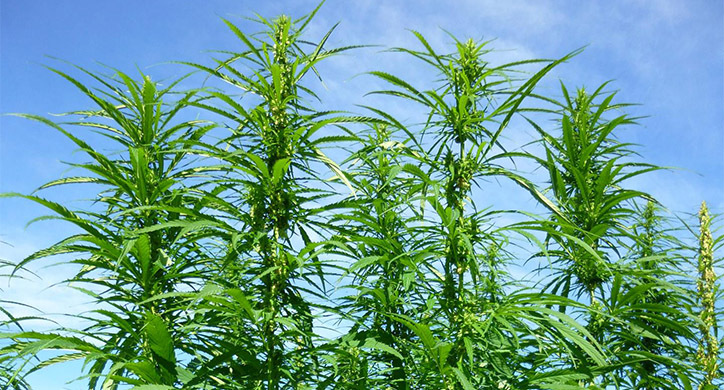 Marijuana and hemp are from the same cannabis plant family and share many of the same characteristics. However, they differ in the amount of THC and CBD each plant produces. Marijuana contains higher amounts of THC and less CBD; hemp contains more CBD and less THC. What are some of the health claims of CBD? There are thousands of studies on CBD in the U.S. National Library of Medicine database. 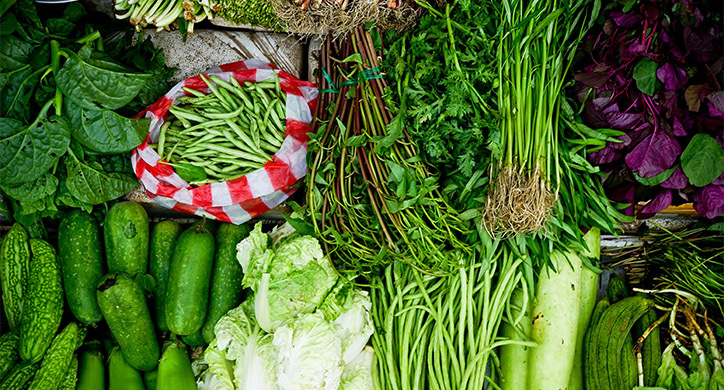 Over 2,500 of these have been conducted with grants from the National Institutes of Health. 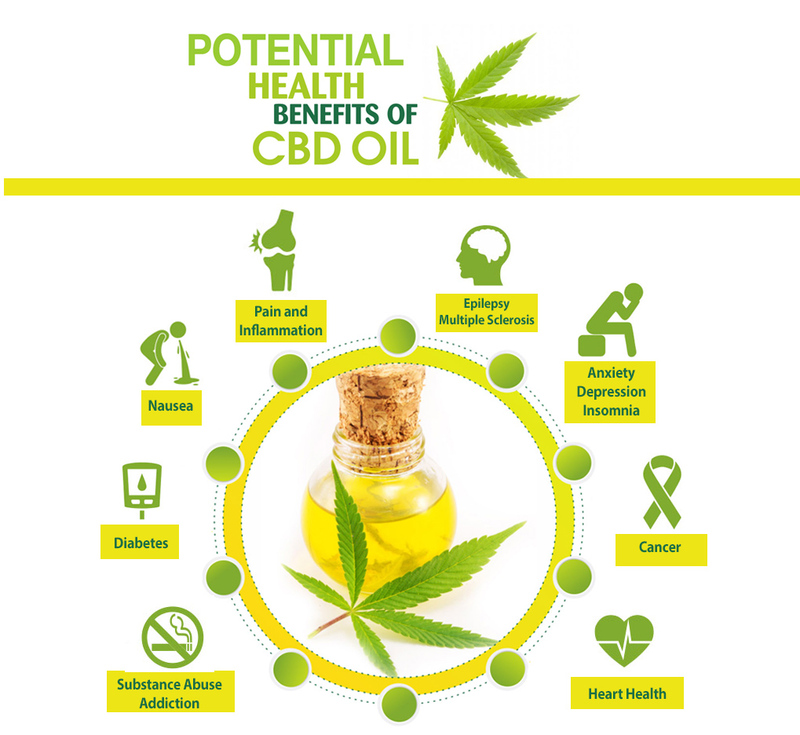 The premise is that CBD and other cannabinoids derived from marijuana or hemp provide numerous health benefits without the complications of the psychoactive THC. CBD has therapeutic promise in the treatment of inflammation, pain, seizures, substance abuse, mental health, HIV/Aids, Alzheimer’s, Parkinson’s multiple sclerosis and even cancer. Most of these studies are conducted in the lab, as it is difficult to run human experiments and get research funding using a Schedule 1 drug. But currently, there are over 300 registered clinical trials underway. And most compelling, your friends, your brother, your mother, your cousin – are providing stories that it works for them. Despite these studies, regulators, health care providers, and consumers are still unclear about the short and long-term effects of the cannabis plant. Further clinical studies (on humans, not animals) will help clarify the potential (or not) of this cannabis compound. Cannabinoids (CBD, THC, and many others) activate receptors in the endocannabinoid system. These receptors are a bridge between our body and our mind. 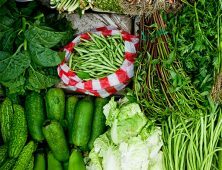 Not only do they regulate inflammation, but they also a major role in pleasure, memory, thinking, concentration, coordination, awareness of time, appetite, pain and taste, touch, smell, hearing, and sight. 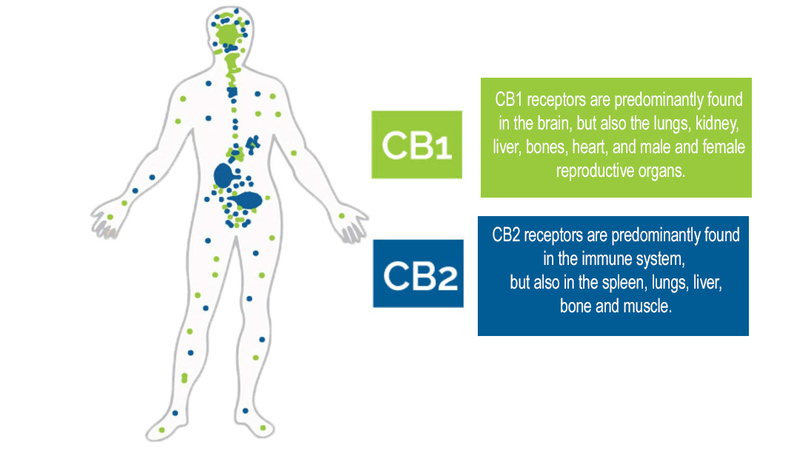 The major cannabinoid receptors are CB1 and CB2, and they are located on cells throughout the body: in the brain, organs, connective tissues, glands, and immune cells. To illustrate how the endocannabinoid system works, think of times you are under stress. 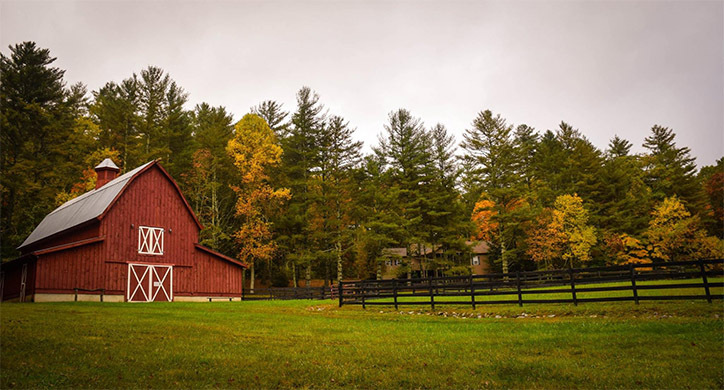 You might lace up your running shoes, take a walk in the fresh air, or hit the gym to relax. Exercise often induces a change in mental attitude –a feeling of happiness, inner harmony or boundless energy. This is like the feeling of rejuvenation you get after exercise. The underlying reason for this de-stressing relief is that exercise activates the endocannabinoid system. Your body, after exercise, feels more balanced. The same is said to apply after taking CBD. 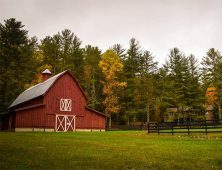 How big is the market for CBD? Betting on the continued evolvement of the industry, particularly the support for the legalization of cannabis in the U.S., investment in marijuana and hemp has skyrocketed. 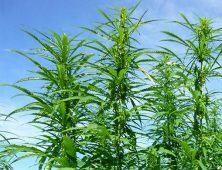 Constellation Brands has invested $4 billion in Canopy Growth Corporation, Molson Coors has teamed up with The Hydropothecary Corporation to produce non-alcoholic, infused beverages, Heineken’s Lagunitas craft-brewing has launched Hi-Fi Hops, a sparkling water infused with THC and/or CBD, and even Coca-Colais closely watching the market. And according to Marijuana Business Daily, Marijuana companies across the globe are going public and scaling up to meet demand. The industry is on track to raise a record $8 billion by the end of 2018, up from 3.5 billion in 2017. 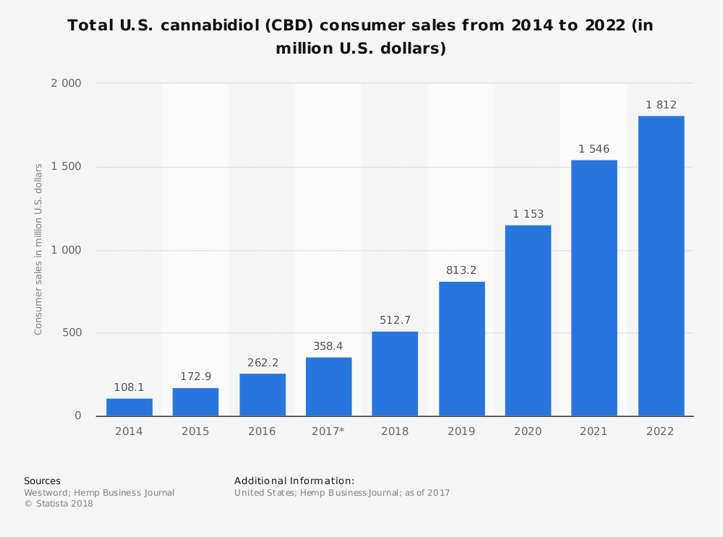 According to industry estimates, the market for CBD will show continued growth through 2022, surpassing $1.8 in sales. So, should you buy CBD? The science is promising, but there are no standardized production practices. For example, when you drink a bottle of beer you know how much alcohol you are ingesting. There are no standards for CBD either in the product or set standards for how it is made. Also, no company that sells CBD products can make any health claims. You need to do your research to find a reputable supplier and the best quality before purchasing CBD products. I am going to give it a try for my arthritis. This is a pivotal time in the world of cannabis policy and research. Shifting public sentiment, conflicting and impeded scientific research, and legislative battles have fueled the debate about what, if any, harms or benefits can be attributed to the use of cannabis or its derivatives. This report … puts forth recommendations to help advance the research field and better inform public health decisions. Studies thus far have shown CBD can be effective for many conditions, it is non-psychoactive and has very few negative side effects. Currently, the FDA does not allow CBD producers to make any health claims, but anecdotally there are many success stories. If you want to explore CBD, consult with your Doctor, and do your research to find the best brand for you.